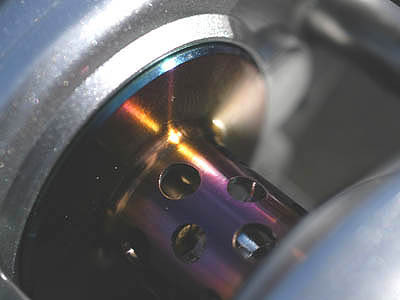 Introduction: Concurrent with the announcement of their, newly designed 2005 Metanium XT reels, Shimano Japan made it known that the very popular Metanium MG was to be taken out of production. This overseas brother of the Chronarch 100MG has gained widespread popularity and were it not for a few quirks here and there, it might just be the perfect middle high end casting reel for freshwater applications. Join us as we take our first and final look of the former Metanium MG.
Impressions: Those familiar with the US market Shimano Chronarch and Japanese Market Metanium XT reels already know how close to perfection the shape, size and open spool design of these reels are. One thing that has always plagued these reels are odd finishes. In fact, aside from the pearl white finish of the original Chronarch A, I was always left to wonder "why?". But in the Metanium MG, Shimano Japan got it right. No misplaced mixing of gold and silver color schemes, no boring dark grey paint jobs, no strange solid burgundy or gold colored reels, instead, the Metanium MG sports a very sophisticated and elegant metallic silver finish with matching silver and chrome plates and accents. The Field Tests: As with most of the Shimano Japan reels, our Metanium MG came with a short, 70mm handle that we quickly replaced with an aftermarket ZPI Carbon version in 85mm. For line, we've used a variety of different types all performing equally well on this reel but finally settled on Berkley Fireline in 20lb test for this review. 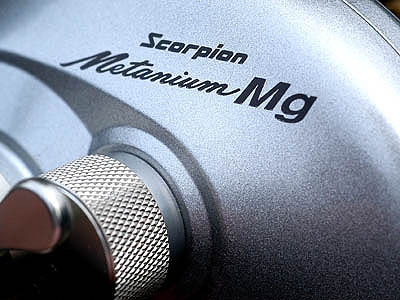 Casting & Pitching: While not the furthest casting reel we've used, the Metanium MG more than holds its own compared to other reels in its price range. 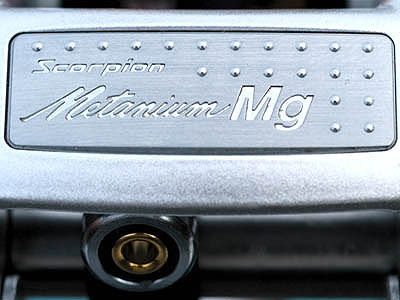 The centrifugal cast control system is easy to access thanks to the flip away side plate of the Metanium MG, and is rather simple to fine tune and adjust as you go. Once dialed in, performance is very sure and reliable. Turn the brakes off entirely and loosen the cast control knob of this reel, and what you get in return is a pitching machine. Matched up with our Kistler Helium He76MHC, we were able to pitch jigs and weightless Senko's effortlessly to our intended targets. 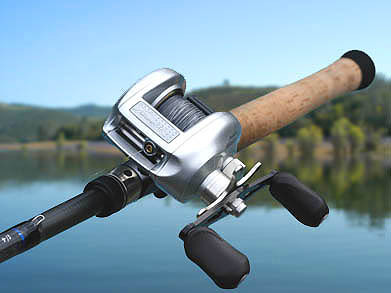 The wide open design of this reel provides ample room for one to thumb the spool controlling delivery during pitch or cast, and providing extra reinforcement during a hookset.